With their recent analysis, Infiniti Research has observed that regions such as the Middle East and Africa (MENA) are increasing their commitments to renewables and researching ways to make processes more viable and efficient. The UAE announced in January that it plans to invest $163 billion in renewable energy projects. The aim of this investment is to meet close to half of the country’s power needs using renewable sources by 2050. The UAE has been working to reduce its reliance on fossil fuels, and as prices of solar and wind power continue to decrease, this goal is becoming more attainable. Prime Minister Sheikh Mohammed bin Rashid al-Maktoum says the hope is to fulfill 44% of the country’s energy needs from renewables by 2050, with 38% coming from gas, 12% from cleaner fossil fuel, and 6% from nuclear. 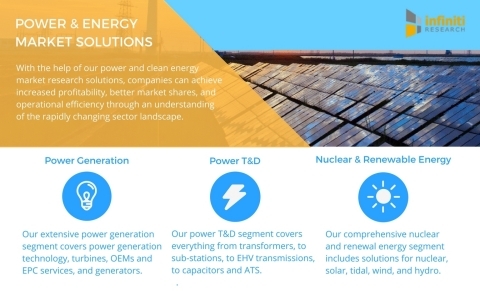 There are some challenges with relying on solar and wind power, as there are periods of time without sun or wind to generate power, but many large organizations and entrepreneurs are developing energy storage and generation solutions to overcome this. The country’s plan is to increase usage efficiency by 40% clean-energy contributions to 50%. How can Infiniti Research Help? Countless opportunities are opening in the clean energy market around the world. However, it can be challenging to track and evaluate all the available markets and identify which ones are the most advantageous to enter. Market intelligence can analyze multiple markets, including relevant regulations, incentives, competitors, and potential partners, allowing you to make well-informed decisions when entering a new market. Infiniti Research recently performed a market assessment for a leading solar panel manufacturer that wanted to understand the potential market opportunities for its solar cell products in Latin America. Infiniti’s research experts analyzed the market in order to quantify the demand for the client’s products and provide qualitative insights specific to market structure and trends. Request a brochure and see how you can benefit from Infiniti’s services. With 14 years of experience and offices across three continents, Infiniti Research has been instrumental in providing a complete range of competitive intelligence, strategy, and research services for over 550 companies across the globe.